Doug Rushton has been a Thurston County resident since 1984 and is a native Washingtonian. 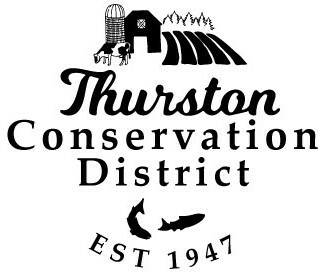 He has been a volunteer member of the Thurston Conservation District Board of Supervisors since 1994, having started as an associate. From 1994 – 2008 he served as an elected member. He now serves as an appointed member. I enjoy working with landowners as they work with District staff to become better stewards of their lands. The District’s emphasis on protecting and improving water quality and salmon habitat, technical assistance and education helping landowner’s meet their goals is an important community function. Filling a land stewardship niche with voluntary programs, the District assists thousands each year enhancing our community and natural resources to benefit us all by promoting sustainable land stewardship. At the District, we all strive to do better, improve our skills, and everyday be just a little more helpful to our clients. Though I volunteer at the Conservation District, I find the capacity to see a project through from start to finish, working with our various partners and the landowners, immensely gratifying. Noting the look of satisfaction on a landowner’s face when a project is completed brings much esteemed. The demand for District services will do nothing but increase in the future – with land uses changing from working forestry and agricultural lands, we are tailoring programs to the emerging needs. We are linking with efforts to protect and improve Puget Sound, and we are incorporating climate change, invasive species, water management and other needs into our every day operations. Our plan is to continue adapting to meet the needs of the people, our partners, and the land. As well as years of CD experience, I have worked professionally in water management, forestry, wildlife habitat, management and restoration, and watershed planning. I serve on various Washington Association of Conservation Districts and state Conservation Commission committees, the National Association of Conservation Districts (NACD) forestry committee and sit on the NACD board as the national director from Washington.